19 Responses to Marshall E. G.
I enjoyed listening to this special almost every Christmas Eve. It's interesting enough that Marshall frequently quoted Scripture in his introductions, postludes, and narrations. (I don't know what his own faith was, but seems like I recall his son, game show host Peter Marshall, was a religious man.) Many of the programs dealt with God, or the devil, or similar themes. I think one program title: "They shall stone them with stones" was Biblical in origin. Still, religious themes or not, I'm still struck by the morality plays that some of these episodes were. It's not going to be unusual to find that, I suppose, in a program like this that essentially had a different plot and cast from one show to another. The old "Twilight Zone" was often like that, and there have been other shows. I recnetly listen to an RMT show called "The Plastic Man". Featuring the vocal talents of Don Scardino among others this show featured an element of mystery (telepathy and mind control, clairvoyance, ghosts) and did not paint any of those in a favorable light, like many RMT episodes. However, set in southern California (surprise, surprise) this program also was not positive toward infidelity, materialism, sexual immorality, transcendental meditation or other such things that were becoming less and less unfavorable in the media of the time of the original broadcast. In addition, this program even seemed to paint those who would take revenge after being wronged by the aforementioned in a dark, negative light as well. Looking at so many programs I see today reminds me why the RMT was so enjoyable to listen to. Don't know if it was Mr. Brown's ethics driving the content, but he did indeed create something memorable for a variety of reasons. There were plenty of shows that were not super religious or Christianized in nature. It depended, but many episodes were quite progressive for the times. But your point is well taken. I do see what you're talking about. The game show host, Peter Marshall, was NOT EG Marshall's son. Does anyone know how much EG Marshall made as host of CBSMT? The actors made very little per episode while the writers made a little more, but I have wondered how much EG Marshall made? No... there was a flat rate for everyone and it was union scale, $73.92 per episode. But it was only 2 or 3 hours of work, so not too bad. I'm thinking the host got more that that, as he had to be there for 7 shows a week. But, if he got the same union scale it would be $517.44 a week, not too bad for the 1970s. I think they did a couple of shows a day, so it was probably only a 3 or 4-day work week. I suspect a lot of the stars did it for fun, or could squeeze it in between their other gigs. E. G. Marshall was born Everett Eugene Grunz. He played Beverly D'Angelo's father, Art, in National Lampoon's "Christmas Vacation." Hey, CBS Radio Mystery Theater fans- Our splendid Host EG Marshall is in a Movie Playing now on TCM Cable Channel- MAN ON FIRE (1957), he plays Sam Dunstock in the movie, that stars Bing Crosby. This is the first time I've seen him in a film! This film predates Mystery Theater by about 17 years! You can watch EG Marshall in the film On Demand this week on TCM app. We love you, EG Marshall! EG Marshall also appeared in the highly-rated film 12 ANGRY MEN (1957), with Henry Fonda and other well known actors. The cast included Martin Balsam from PSYCHO and Jack Klugman from THE TWILIGHT ZONE, TV'S THE ODD COUPLE and especially QUINCY. Marshall's later TV work in the 60's included THE DEFENDERS with also Robert Reed(later from THE BRADY BUNCH) and as the main character in an early TV movie, THE POPPY IS ALSO A FLOWER. EG Marshall plays a suberb role as a prosecuting attorney of the court marshall in The Caine Mutiny, with Humphrey Bogart. Remembering E.G. MARSHALL (1914 – 1998), who was born on June 18. He is best known for his television roles as the lawyer Lawrence Preston on The Defenders in the 1960s and as neurosurgeon David Craig on The Bold Ones: The New Doctors in the 1970s. Among his film roles he is perhaps best known as the unflappable, conscientious "Juror #4" in Sidney Lumet's courtroom drama, 12 Angry Men (1957). Loved his portrayal of Mr.Pratt in Creepshow , no one could ever have done a better job. E. G. Marshall (born Everett Eugene Grunz, June 18, 1914 – August 24, 1998) was an American actor, best known for his television roles as the lawyer Lawrence Preston on The Defenders in the 1960s and as neurosurgeon David Craig on The Bold Ones: The New Doctors in the 1970s. Among his film roles, he is perhaps best known as the unflappable, conscientious "Juror #4" in Sidney Lumet's courtroom drama 12 Angry Men (1957). He also played the President of the United States in Superman II (1980) and Superman II: The Richard Donner Cut E.G. 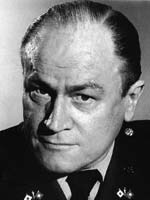 Marshall is credited with over 150 Movie and TV appearances. Marshall landed the leading roles in The Crucible and Waiting for Godot in the 1940's As he has had a long career some of the movies he appeared in were The Caine Mutiny (1954), Billy Jack Goes to Washington (1977), Tora! Tora! Tora! (1970), The Left Hand of God (1955), Collision Course: Truman vs. MacArthur (1976) , National Lampoon's Christmas Vacation (1989) and many others. Some of the TV Shows he appeared in were Alfred Hitchcock Presents (1957), The Defenders, Ellery Queen: Don't Look Behind You (1971), Vampire (1979) (TV film), Kennedy (1983 TV miniseries), and many others He hosted CBS Radio Mystery Theater from its beginning until the 1982 season. Don't forget his phenomenal role as Mr. Pratt in the film Creepshow. EG did his narrations once a month. About a dozen scripts in one day. The radio actors I worked with on MT were amazing. Often played a couple of roles in a show. Maybe 4 actors doing 6 or 7 voices. And usually did it same way in retakes, same accent, inflections etc. Made editing a breeze. Sometimes Hi would do a cameo too. A great host, but terrible as Scrooge, in CBSRMT's adaptation of A CHRISTMAS CAROL, lol! :D Also, he should never have tried to recite "The Goblins Will Get Ya" because it just fell flat. Recitation was not his forte, but as host of the show he was really good. He was as much a part of the show as the actors themselves.